Chuck Does Art: DIY: "Magic Folding Cube" or "Yoshimoto Cube"
These are super fun. Usually used as picture cubes, a 'magic folding cube' (more formally called Yoshimoto Cube) is a cube made of 8 smaller cubes that can be unfolded multiple times until eventually it is inside out and then unfolded more until it is back to its original form. If you make one well, you can put photos on all sides of the exterior cube, plus larger photos inside, and as you unfold the cube reveal the different photos. 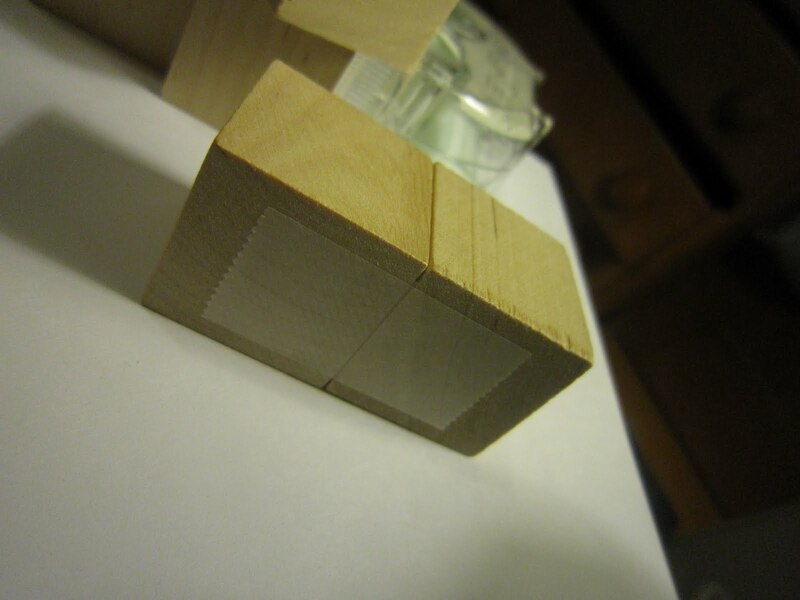 To make this, I used 8 identical wooden cubes, clear tape, and some stickers to delineate the different sides. The trick is to make good hinges for the cubes to rotate on (See schematic for simpler directions than my poorly worded ones below). Each hinge is between only two of the small cubes. You need to make each hinge double sided for support (in other words, tape the inside and outside of the hinge). To make a hinge, place one layer of tape on the two cubes to connect them on top. Make sure that whenever you place tape, the cubes are flush against each other. Next, fold one cube over the other, so that the piece of tape now is between the two cubes. Place a piece of tape to connect the cubes again; this piece should be on the opposite side of the hinge as the first piece of tape. You will need to make four of these hinges, for a total of 8 cubes linked in pairs. Next, you need to make hinges to connect each pair of cubes to the other cubes. The layout for these hinges is shown in the diagram. 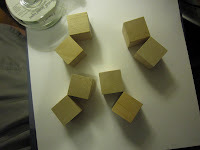 Fortunately, all of the hinges are on the outside of the completed cube, so it is very simple to line up the pre-made pairs and connect them up. If you look at the diagram, you can start your cube simply by making your cube so that the hinges stack one on top of the other and face outwards (the 'C' set of hinges). Then, tape the front two columns of the cube (the 'B' hinges) and the back top and bottom hinges (the 'A' hinges). To decorate the cube, I just put different dinosaur stickers on each of the original 6 outside faces. This means that when the cube is completely folded in, no stickers are visible (if you have more stickers than I do, you can also put stickers on these 'inside-out' faces). You may also want to decorate the interior sections that are revealed when the cube is simple unfolded into one long strip. Shown is a montage of my dinosaur cube. Note that when you decorate just the outside of the cube, you cover the outside plus two of the 'long' (unfolded) conformations, which means that the other 'long' conformation is completely hidden from view initially, as well as all of the exterior faces of the 'inside-out' conformation. If you look closely at the stickers, you can also see how each step led to the next by making one fold (or flipping it over). Finally a topic I can fully get behind, because I love cubes. Did you record and embed those videos yourself? I'm impressed. The movement from faceless pictures to faceless video is getting ultra-creepy. Glad to have a geometry fan. The videos are easy to embed, you just click the 'add video' button in the 'new post' area. Would it be less strange to have a video of me folding a cube in front of my face? Ok I have a question, which size of blocks did you use? 1x1 or 2x2?